Not much to say today…a bit of a grey day, waiting for the snow!?! 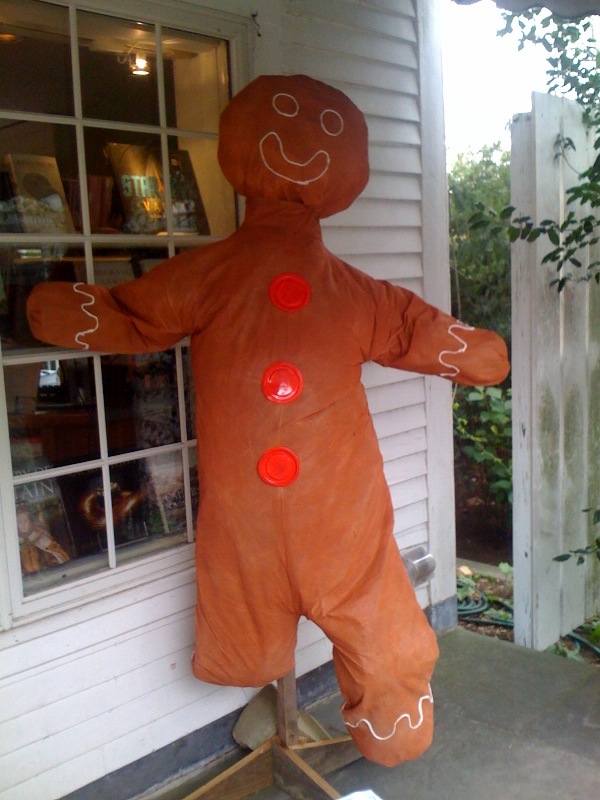 I thought I’d give you one last look at a Halloween gingerbread “scarecrow” – this one is in front of Edgartown Books. It turn out these are being done by the kids at the Martha’s Vineyard Charter School, and they are popping up all over the is land. Love this place. And now for something completely different: in the interest of the impending winter (argh), I have decided to trim my blogging days to Monday, Wednesday and Friday. I did not want to bore you – I mean, lovely as they are, how many library photos can you stand? Or pics of the crackling fireplace at The Newes? Not to worry – iIf anything truly exciting arises, I promise to add an extra post in here or there. In the meantime, stay out of the nor’easter!